K (named kay /keɪ/ )  is the eleventh letter of the modern English alphabet and the ISO basic Latin alphabet. In English, the letter K usually represents the voiceless velar plosive. Kappa is the 10th letter of the Greek alphabet, used to represent the  sound in Ancient and Modern Greek. 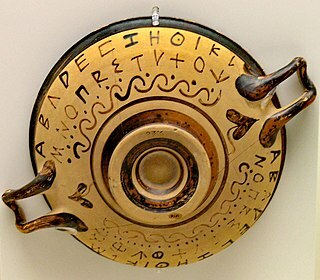 In the system of Greek numerals, Kʹ has a value of 20. It was derived from the Phoenician letter kaph . Letters that arose from kappa include the Roman K and Cyrillic К.
Kaf is the eleventh letter of the Semitic abjads, including Phoenician Kāp ऊ, Hebrew Kāf כ, Aramaic Kāp ࡊ, Syriac Kāp̄ ܟܟ, and Arabic Kāf ک/ك. The ancient Egyptian Hand (hieroglyph) is an alphabetic hieroglyph with the meaning of "d"; it is also used in the word for 'hand', and actions that are performed, i.e. by the 'way of one's hands', or actions. The calends or kalends is the first day of every month in the Roman calendar. The English word calendar is derived from this word. 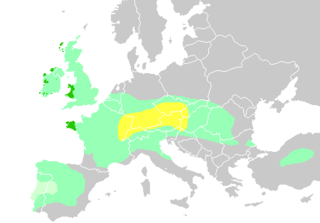 Today, English is the only Germanic language to productively use "hard" ⟨c⟩ (outside the digraph ⟨ck⟩) rather than ⟨k⟩ (although Dutch uses it in loaned words of Latin origin, and the pronunciation of these words follows the same hard/soft distinction as in English). [ citation needed ] The letter ⟨k⟩ is silent at the start of an English word when it comes before the letter ⟨n⟩, as in the words "knight," "knife," "knot," "know," and "knee". Like J, X, Q, and Z, K is not used very frequently in English. It is the fifth least frequently used letter in the English language, with a frequency of about 0.8% in words. In English orthography, the letter ⟨k⟩ normally reflects the pronunciation of  and the letter ⟨g⟩ normally is pronounced or "hard" ⟨g⟩, as in goose, gargoyle and game; or "soft" ⟨g⟩, generally before ⟨i⟩ or ⟨e⟩, as in giant, ginger and geology; or in some words of French origin, such as rouge, beige and genre. However, silent ⟨k⟩ and ⟨g⟩ occur because of apheresis, the dropping of the initial sound of a word. Ʞ ʞ : Turned capital and small k were used in transcriptions of the Dakota language in publications of the American Board of Ethnology in the late 19th century. Turned small k was also used for a velar click in the International Phonetic Alphabet but its use was withdrawn in 1970. 1Also for encodings based on ASCII, including the DOS, Windows, ISO-8859 and nMacintosh families of encodings. Josef K is the name of the principal character in Franz Kafka's novel The Trial . W is the 23rd letter of the modern English and ISO basic Latin alphabets. ↑ Gordon, Cyrus H. (1970). "The Accidental Invention of the Phonemic Alphabet". Journal of Near Eastern Studies. 29 (3): 193. doi:10.1086/372069. JSTOR 543451. ↑ Everson, Michael; Jacquerye, Denis; Lilley, Chris (2012-07-26). "L2/12-270: Proposal for the addition of ten Latin characters to the UCS" (PDF).